The Land Transportation and Franchising Regulatory Board (LTFRB) chief Martin Delgra and Land Transportation Office (LTO) chief Ed Galvante told press that they're willing to comply with the President Duterte's order. President Duterte said during press conference earlier Sunday, that he continues to receive reports of corruption in regulatory offices, with particular mention of the Land Transportation Office and the Land Transportation and Franchising Regulatory Board. According to ABS-CBN News, hours after the president announced his declaration that all positions for presidential appointees will be made vacant to address the problem of corruption in government offices, Galvante immidiately said that he will comply with the President's instructions. He said, "I will comply. 'Yun ang hingi ng Pangulo, I will comply." "Papasok ako bukas para magayos ng gamit. But I will comply with the instructions. 'Yung mga gamit na dapat kong i-move out," he added. While LTFRB chief Martin Delgra promised to comply with President Rodrigo Duterte's order to vacate his post once a formal directive has been issued. On the other hand, president Duterte also asked the chiefs of both agencies to report to him next week. What do you think of this issue? 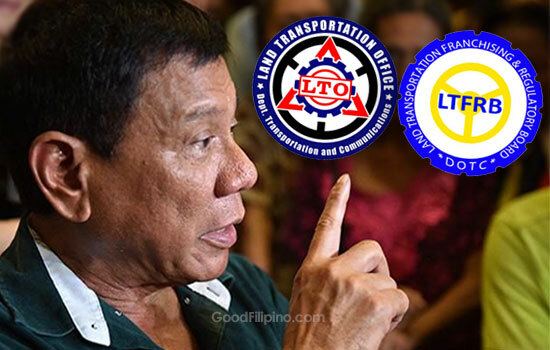 Will the LTO and LTFRB chiefs will comply to Duterte's order? Please share your thoughts below. Comments or suggestions about "LTO and LTFRB chiefs to comply with Duterte's order" is important to us, you may share it by using the comment box below.